This is my Great, Great, Grandfather that will portrayed in a living history. On Saturday afternoon June 17 at 2 pm during Czech Days in Tabor, Darrell Beran will be portraying Charles F. Blachnik, his great grandfather, telling about his life history. The presentation will take place in the Czech Heritage Park starting at the museum next to the post office on the main street. Darrell is just one of five presenters portraying different Tabor pioneers that day. There is only one performance, so don’t be late. Please let other members of your family know about the presentation as I am not sure I know all of them. Cost is $5 per person which includes a kolache and bottle of water. Oh and don’t miss the family museum while you are there! Was he a trouble maker, too?….jk…… What was his website called?…. TaBcola.com? 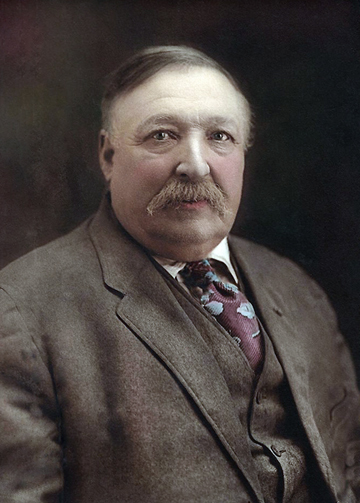 But seriously, I think it is great that you can trace your South Dakota ancestry back to a pioneer great, great grandfather from Bon Homme County like that, who was also a significant civic leader. Speed forward to the 21st century and you are carrying on the tradition, in my opinion (I don’t care what the Chamber says….. 😉 ). There is a strong family resemblance. He’s a dead ringer for retired judge Bill Srstka. May be some relation there as well. Yes, a strong family resemblance. The time before credit card mayors was when we could be proud of our regional heritage. In 13 months let’s elect a mayor with a better background or at least some accomplishments other than cheating people with 35% interest. Preferably, one with some form of military service who doesn’t play tennis and never worked for Sanford. You should see this guys father. He had long hair, and a handlebar mustache. I always said he looked like the original Wyatt Earp.